Do you have a passion to help people and work in the medical field? If so, have you considered studying Invasive Cardiovascular Technology? Cardiovascular technologists perform highly specialized procedures and treatments in heart disease. What Does an Invasive Cardiovascular Technologist Do? You might also hear invasive cardiovascular technologists referred to as a cardiology technologists. Cardiology technologists assist vascular surgeons and cardiologists with invasive catheterization procedures into a patient’s heart such as preparation and insertion of cardiac catheters, pacemakers and stents. They also help prepare and monitor patients during heart surgery. The majority of all cardiovascular technicians work in hospitals; however, they may also work in medical labs, physicians offices or outpatient care centers. In this program, students will study techniques used in diagnosis, treatment and follow-up of cardiovascular disease. Registering patients and verifying medical history. Completing electrocardiograms by attaching electrodes to the patient’s chest, arms and legs. Maintaining equipment by ensuring computers and equipment are operating properly. Evaluating diagnostic studies for quality and diagnosis. Supporting physicians in diagnosing and treating by assisting physicians during surgery. This program is unique to El Centro within the colleges of the DCCCD. The Invasive Cardiovascular Technology program is a two-year Associate of Applied Science degree program. 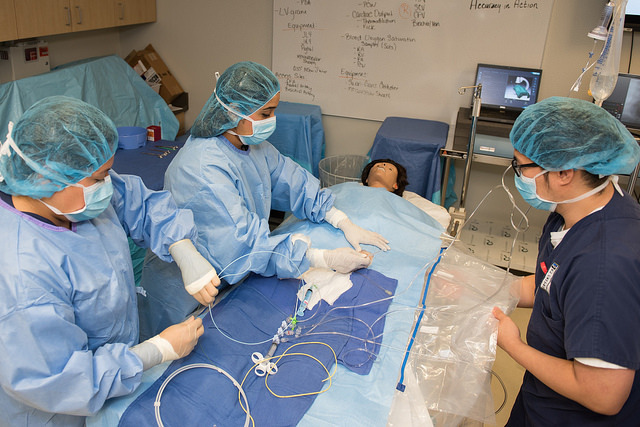 In the associate degree program, you’ll take classes in subject areas like anatomy and physiology, cardiovascular anatomy, cardiac procedures, theory of techniques used in diagnosis and more. Additionally, you’ll also need to work a number of clinical training hours to earn field experience. Full-time students can complete the program in about two years. This program may lead to an occupational license for which a prior criminal history may make a student ineligible. For more information, please visit HB 1508 licensing requirements. Often these programs only have a set number of available spots for students, so the admissions process can be competitive. Make sure to check out El Centro’s Invasive Cardiovascular Technology admissions packet for all the details. Already Have Your Associate Degree of Bachelor of Science in a Designated Allied Health Field? Check out the Invasive Cardiovascular Technology Advanced Technical certificate. Potential students will be considered on an individual basis to determine if they have adequate background in anatomy, physiology, ECGs and pharmacology. Invasive Cardiovascular students study techniques used in diagnosis, treatment plans and follow-up of cardiovascular disease. Do You Have What It Takes to Become a Cardiovascular Technologist? This is a very rewarding job but can also be challenging. However, with the right skills and qualifications you will succeed. Are Cardiovascular Technologists in Demand? You bet! With a Cardiovascular Technology degree, graduates will be able to start a career in the heart-related health field. Invasive cardiovascular technologists are in demand and employment levels are projected to grow about 17 percent from 2016 to 2026, which is much faster than average. How Much Does a Cardiovascular Tech Make in Texas? Cardiovascular Technologists in Texas make an annual mean wage of $54,230. How Much Will it Cost to Complete My Degree in Cardiovascular Technology? Dallas County residents pay $177 per three-hour class — compare that to what you’d pay elsewhere! Not a Dallas county resident? No problem, we have you covered. Check out our tuition rates for tuition according to your place of residency. How Can I Become an Invasive Cardiology Technologist? Start by going through the DCCCD admissions process and apply for financial aid; then meet with an academic advisor to discuss which classes you should take and how to get started. While you’re here, you should also consider checking out our previous programs of the month.